So, we have a theme-dungeon this time around: This whole dungeon is a fungus/plant-based dungeon, situated in a massive biomass that, unknown to its explorers, is hanging hundreds of feet above the cavern floors! The complex has been raided by a NPC adventuring party as an element of chaos that may resurface any time (or after the complex has been cleared) and the use of the plant monsters herein is absolutely inspired and makes the complex feel delightfully icky, with neat, minor tweaks of the base engines in some cases! Editing and formatting are very good, I noticed no significant glitches apart from a critter missing its bolding. Layout adheres to a beautiful 2-column full-color standard and the pdf comes sans bookmarks, but needs none at this length. Cartography is full color and nice. Huge plus: We get a GM AND a Player-version of the area in which this takes place, providing full VTT-friendly compatibility. 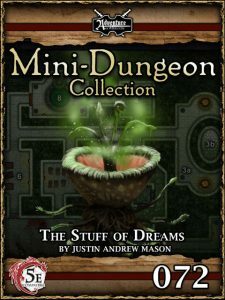 Stephen Yeardley’s “Stuff of Dreams” (here, I believe, erroneously attributed to Justin Andrew Mason) is a truly enjoyable little dungeon with a weird atmosphere, creative choices and some neat challenges. I really liked this one. The 5e-conversion by Chris Harris and Kyle Crider makes ample use of Kobold Press’ amazing Tome of Beast plant monsters, providing proper hyperlinks for them. This retains the strong leitmotif of the dungeon. My final verdict will clock in at 5 stars, omitting my seal of approval only because it would have been amazing to have the biomass deteriorate, making mechanical hazard-style use of the unique, hanging dungeon-idea.